Currently 2.5 billion people live without access to basic sanitation, and approximately 1 billion practice open defecation, most of them living in rural areas. This sanitation crisis is detrimental not only to women’s health but also to their education, dignity, community status, and overall well-being. With improved sanitation for women, women all over the world will experience an elevated standard of living in several aspects. Most women without access to basic sanitation, such as a latrine, must wait for nightfall and an empty field in order to defecate in private, a practice which has serious side effects for many women. Waiting so long to defecate leads to increased chances for urinary tract infections, chronic constipation, and psychological stress. Many women who are going out alone at night are also at risk of physical and sexual assault. The symptoms of menstruation, pregnancy and the postnatal period also become problematic if there are not adequate areas to properly deal with them. Many girls are forced to leave school once they reach puberty and menstruate simply because there are no facilities or supplies accessible to them, and those who choose to stay often miss class during their menstrual cycle, making it harder for them to succeed in the classroom. Furthermore, adult female teachers working in schools without sanitation for women, or women small business owners and employees without access to nearby facilities, must choose between the indignity and health risks of caring for themselves in the open or leaving work. Women who have improved sanitation facilities close to home and work enjoy better health and are able to work more productively. When their families are healthier, women and girls also spend less time caring for sick family members. Many women are leading efforts in their communities for access to safe water and adequate sanitation. As women continue to involve themselves directly in the technical operations and management of water and sanitation services they are increasingly seen as skilled workers capable of achieving high levels of training and expertise. Along with this increase in status many women find themselves in a position to generate income as either a direct or indirect effect of increased sanitation. 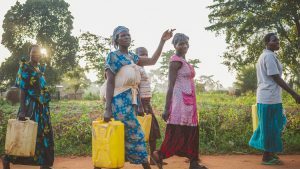 The International Water and Sanitation Centre found from studying 88 water and sanitation projects in 15 countries that projects including the full participation of women are more effective and sustainable than those that are not. 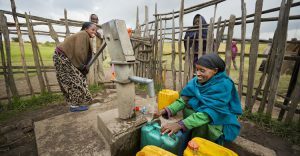 Women play a vital role in raising awareness about water and sanitation issues in their communities, and improved water and sanitation for women are the first steps to empowering women in developing countries. Lifewater strives to provide entire communities with education on disease transmission, effective latrine construction, operation and maintenance, as well as changing social attitudes and behaviors towards proper waste disposal in the hopes of bettering the lives of billions. UN Water, Interagency Task Force on Gender and Water (GWTF), Gender, Water and Sanitation: A Policy Brief (June 2006): 5. UN Water, Interagency Task Force on Gender and Water (GWTF), Gender, Water and Sanitation: A Policy Brief (June 2006): 2.